The last Wednesday of April; the month has gone by quickly, and the year even more so. 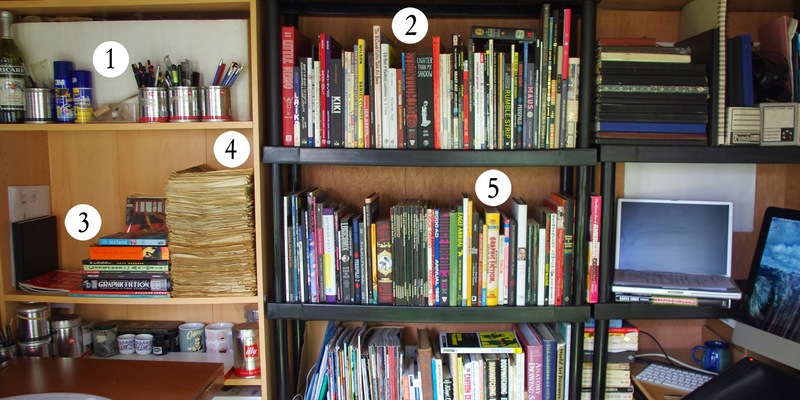 Continuing briskly on, it's that time of the fortnight where comics shelfie *happens* and we take a look at the comic collections/bookshelves of an erstwhile comic creator. This week it's the turn of British artist, Simon Gurr, whose comics background is (to me) more interesting and varied than most; Gurr's career has mainly been in the illustration of non-fiction, educational texts for schools to use, leading to the creation of 3 of his comic books in collaboration with author Eugene Byrne- Brunel: A Graphic Biography, The Bristol Story, and Darwin: A Graphic Biography. 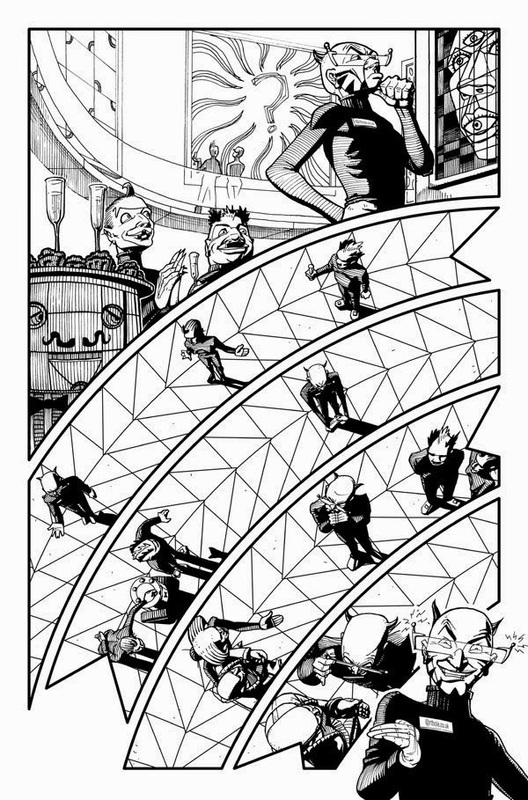 He's also produced a number of comics for 2000AD (such as the 'Head' page below)- there's a handy list of projects he's been involved with here- which serves as a good introduction to his work. 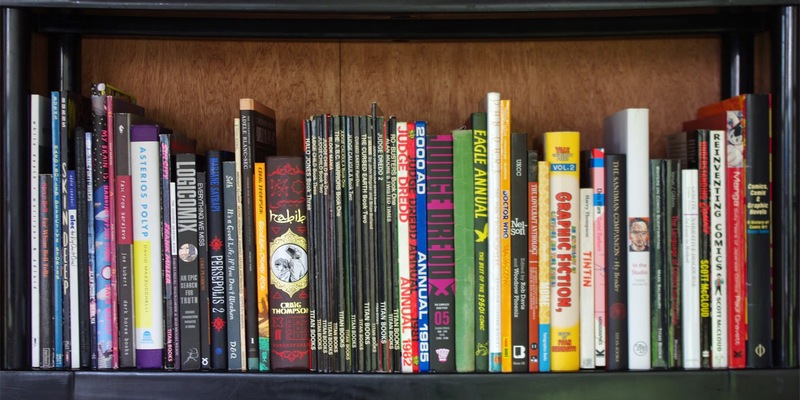 'I've recently had to give a lot of comics away and move the rest out into the studio, so what you see here is practically everything: A longbox of mostly small press and Marvel/DC 'floppies' (1), a top shelf of beloved books (2), a pile of books relating to a current project (3), a stack of 2000ADs from my personal golden age of 1980-1986 (4) and a second shelf of comic books and books about comics (5). Despite the reduction in cat-swinging space, it sort of makes sense to have all my comics input in the place where I make my comics output. An example of this is the comic I'm drawing at the moment. Rob Williams's script reminded me of a classic 2000AD moment and I was able to immediately dip into this tower of yellowing thrill power for reference. 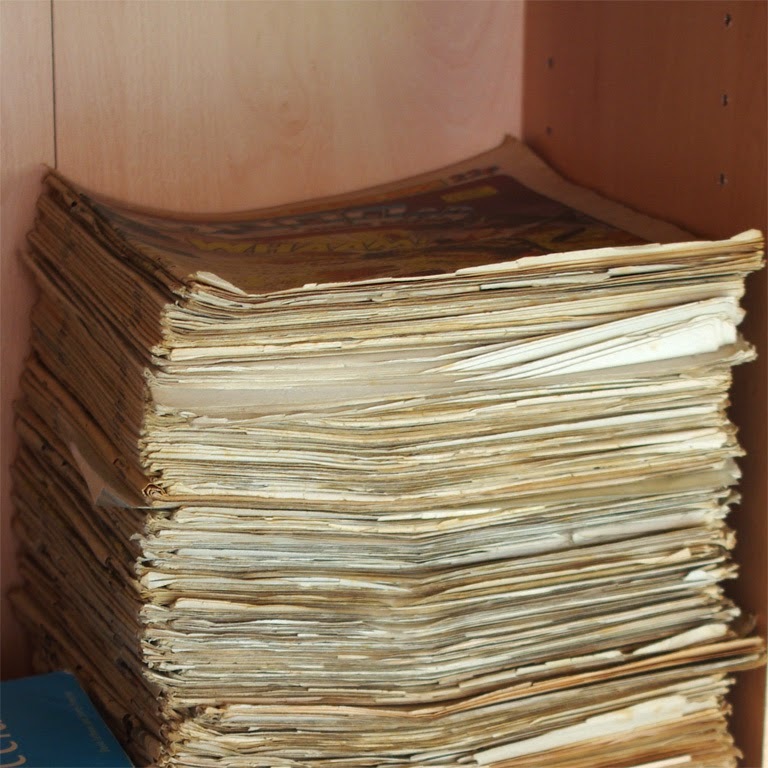 As you can probably tell by their condition, the 2000AD weeklies are the oldest items in my collection. I started buying them after reading the Ro-Busters story Terra Meks at a friend's house, when I was about nine. My earliest remaining issues contain tattered fragments from the Block Mania/Apocalypse War saga, but it's only around Prog 300 (1983) that my brother and I learned not to rip the covers off or draw all over the insides. 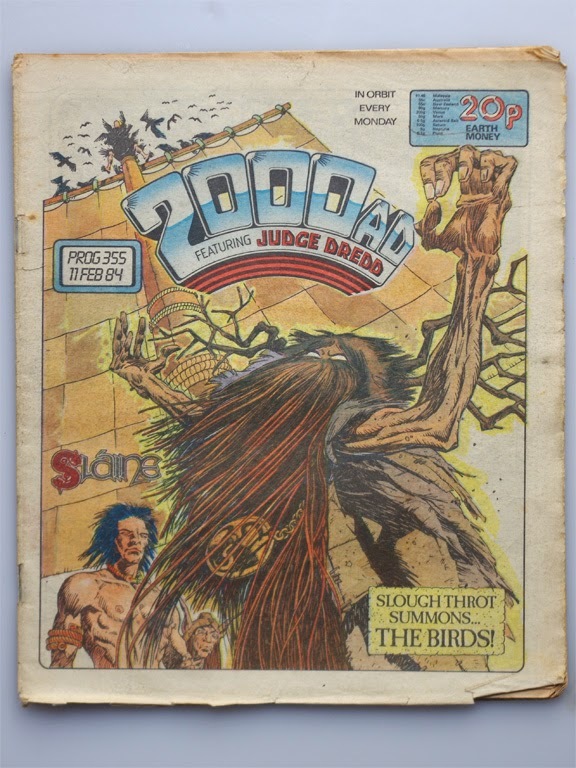 At that time 2000AD was printed on bog paper, with colour restricted to the covers and centre spread, but to me it was perfect. Mick McMahon's work on Slaine back then was one of the best things he (or anyone) has drawn, but other British artists were starting to hit their stride too; Kevin O'Neill, Dave Gibbons, Steve Dillon. Until 1986 my comics diet consisted pretty much of readily available IPC/Fleetway titles; 2000AD, the short-lived Eagle revival and Scream, Eagle's horror-themed sister publication. But then of course Alan Moore & Dave Gibbons (whose work I knew from 2000AD) made Watchmen and this caused me to move from newsagents to real comic shops! Forbidden Planet and Comics Showcase in London sold me The Dark Knight Returns and Elektra: Assassin and I was hooked. 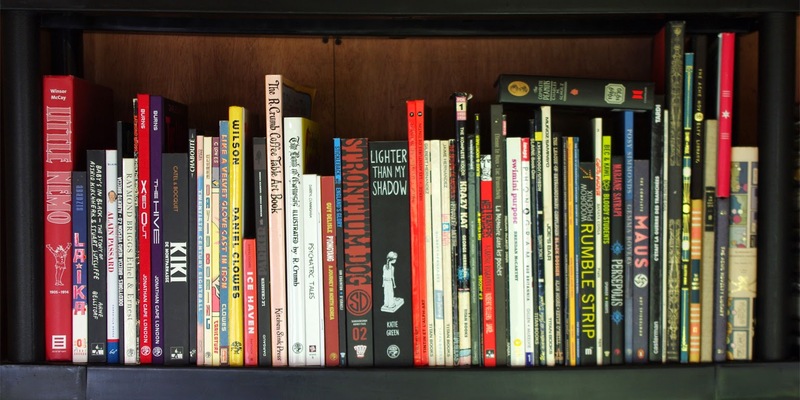 Forever People and Area 51 sustained me when I moved to Bristol where, years later, the much-missed Travelling Man introduced me to the wonders of Fantagraphics, Drawn & Quarterly and Top Shelf. My own top shelf, loosely alphabetised by artist, is now heaving under the weight of many books purchased in Travelling Man. On the next shelf, some more favourites. The black spines in the middle are all Titan Books 2000AD reprints, which means there is a fair amount of duplication in my collection, but Titan's superior crisp white paper really let the black and white artwork shine. 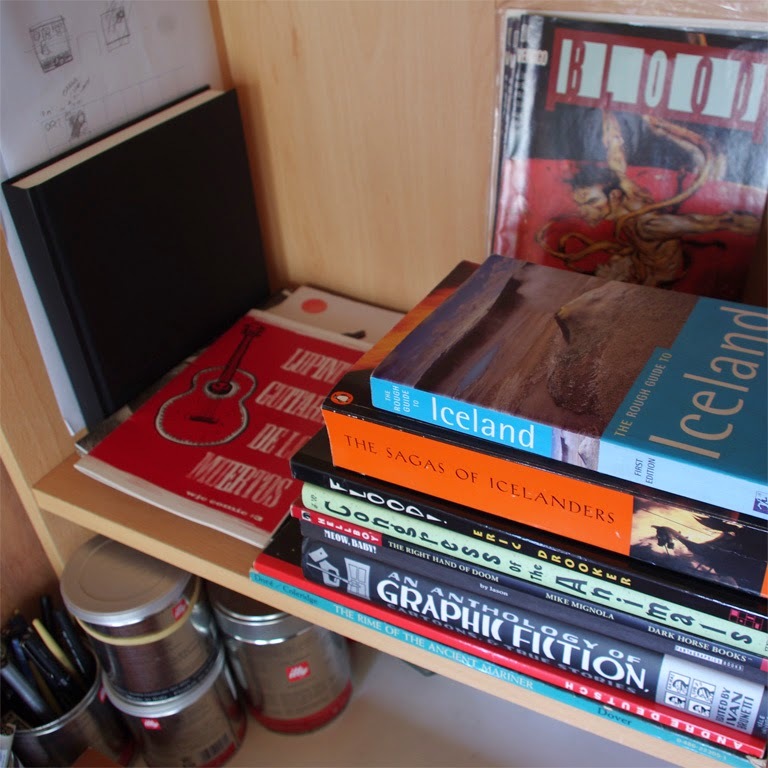 At the far end, a couple of theory books from my BA dissertation and MA, and then some more accessible writing on comics. 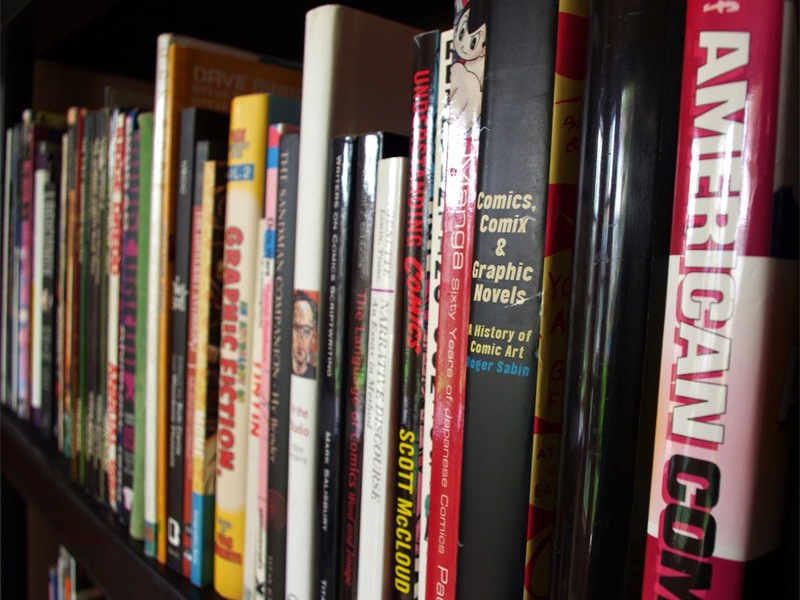 There is no real theme to the longbox except 'comics which won't stand up on their own'. I've taken out a handful of more recent comics and lined them up in front of some of the 90s comics I found in there. Back row: The Collected Alas!Comics by Alexander Zograf/Saša Rakezić, Fred the Clown by Roger Langridge, Paradax! by Peter Milligan & Brendan McCarthy. 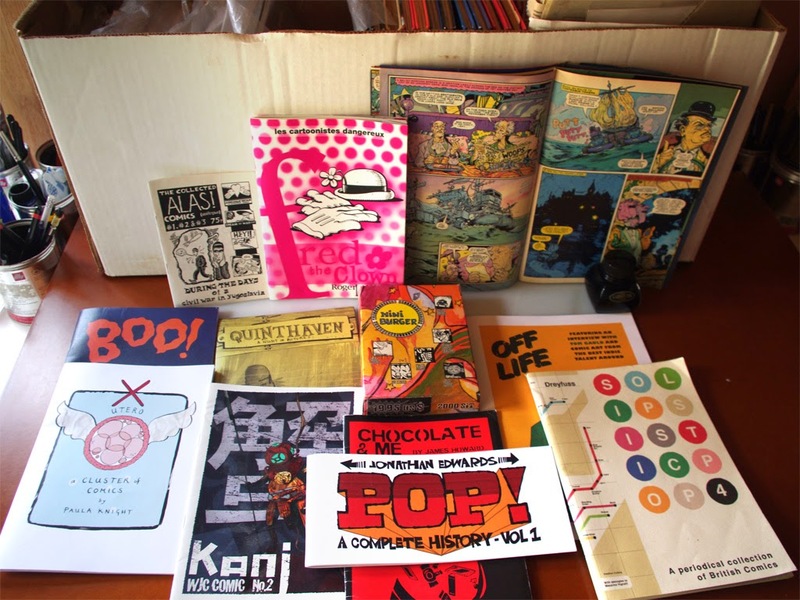 The box in the middle: 'Mini Burger', is from 1995 and contains 12 small Stripburger comics. ORT is a wordless comic, which is why Flood, Congress of The Animals, Winter's Knight and Lupinta's Guitarra are there. Blood is at the back because ORT has vampires in it, but it isn't THAT sort of vampire story. 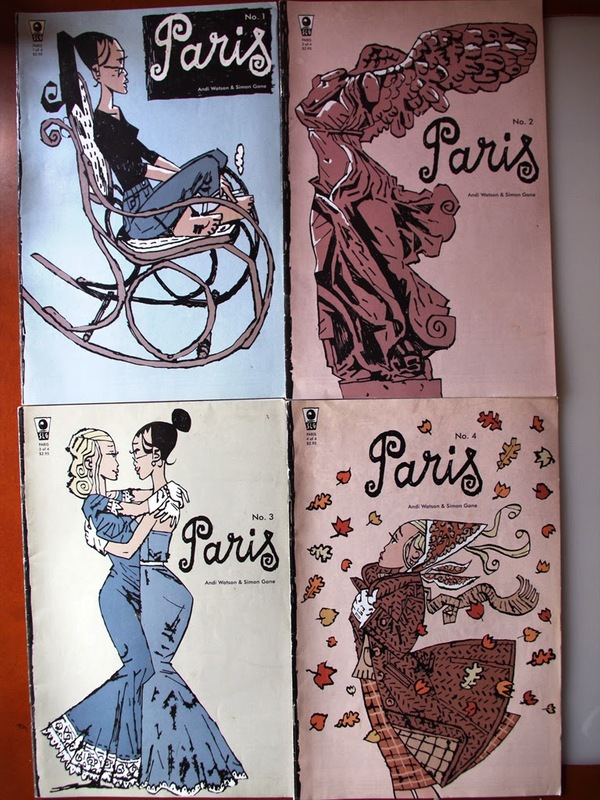 When Paris came out in 2006 I fell completely in love with it. I can't think of a comic I've connected with more instantly and fully than this, I remember the moment I picked it up in the shop. Andi Watson's apparently simple story is served perfectly by Simon's art which captures the beauty of the city, its inhabitants and the two female protagonists without ever overpowering the narrative. This is a much heavier book than this picture suggests. It's over 500 pages long and never once loses sight of its purpose - to tell an intensely painful and personal story which could only be told a) by the person who experienced it, and b) using the unique narrative functions of comics. 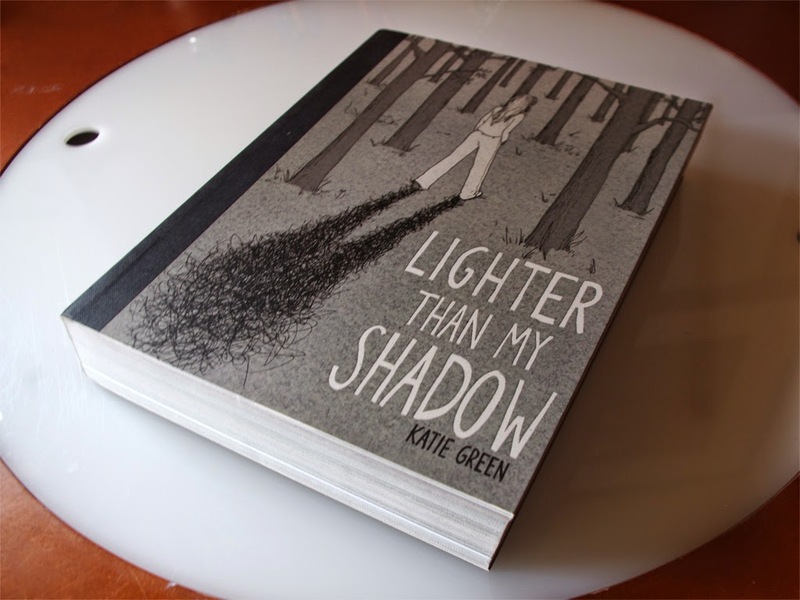 Katie achieves this with courage, insight and considerable technical skill. Many thanks to Simon for his time and participation. 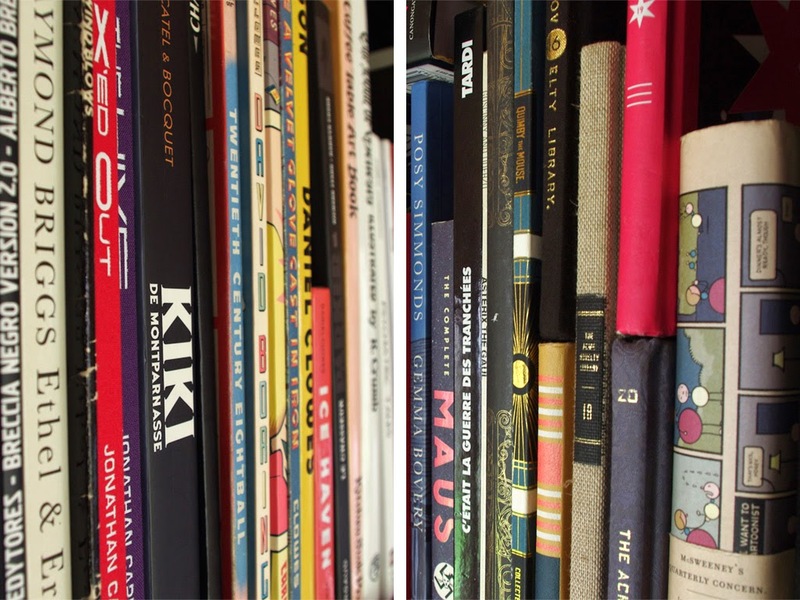 You can view all the previous installments of Comics Shelfie here. Remember to stop by on the 14th of May for the next installment.